Are you ready for the fright of your life? If so, join us as we take you on a journey through the weird and wonderful world of NextGen's Creepy Castle slot game. 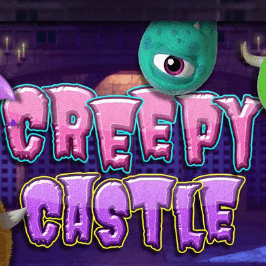 Touting a horror-filled theme, plenty of opportunities to win and an overall fun experience, the Creepy Castle is perfect for slot lovers as well as horror junkies. And thanks to the stellar features and bonuses, all players regardless of experience or passion for the theme will find themselves playing a truly topnotch offering! Play Creepy Castle Slot Demo for Free! Play Creepy Castle for Real Money! Taking inspiration from the ever-popular horror theme, NextGen's Creepy Castle certainly looks the part when it comes to style and design. 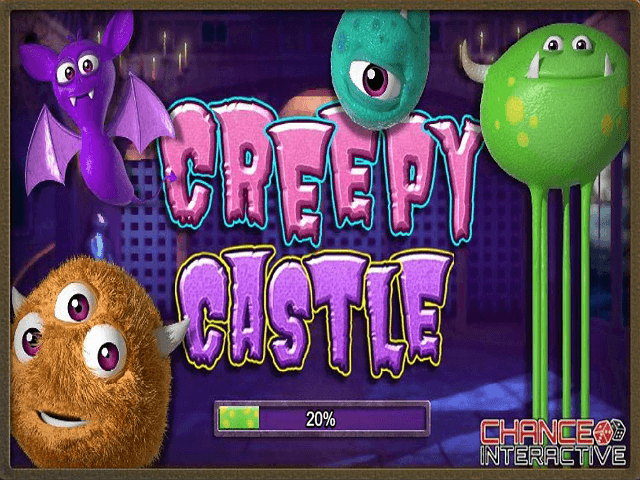 Set inside an ominous-looking castle, this video slot makes you feel as though you're about to embark on a bumpy ride full of screams, unexpected bangs and gruesome images. However, once the reels kick into life, the opposite is true. Instead of a dark and gloomy set of symbols, you're treated to a host of colourful cartoon monsters that are more smiles than snarls. Creepy Castle is all about entertainment, and the decision to subvert a common theme (i.e. serious horror) and make it more about fun than frights is something that works well. 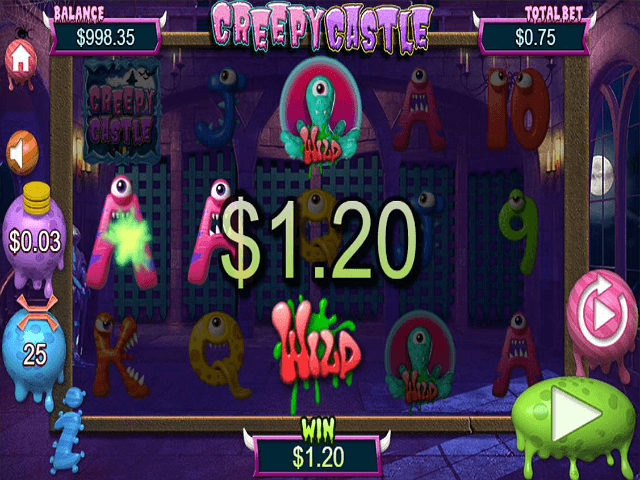 Creepy Castle is a fully adjustable online slot game; you can control all the important variables with a few clicks. Unlike some online slots that force you to play using a fixed number of win lines or bet multiplier, Creepy Castle gives you more flexibility, which is great for newbies. In terms of how to play Creepy Castle, there are two main settings you'll need to adjust: coin size and paylines. At the lowest level, you can set your coin size to 0.01 and the number of active paylines to one for a total spin price of 0.01 credits. At the highest level, you can take the maximum bet to 250 credits by setting the coin size to ten and opening up all 25 win lines. 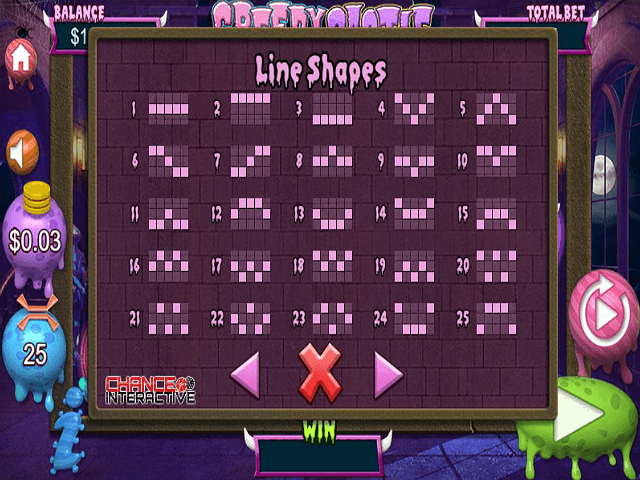 Once you start to spin Creepy Castle's five slime-filled reels, the payout table runs from five times your line bet to 500 times your line bet when you roll in five wild symbols. However, because of this slot's quirky design, there are also some possibilities in terms of special features, which we've outlined below. Like all good online slots, Creepy Castle has its share of ways to win and in this game the route to extra riches is paved with wilds and scatters. In a twist on the norm, wilds in this game come in two forms. Firstly, you have the standard 'wild' symbol that will substitute for any other icon (except the castle scatter) and pay out this game's jackpot. Any monster symbol can become a wild. Depending on how the monsters are feeling, a single spin could turn one to four monsters into wilds, which will then substitute for all other symbols. 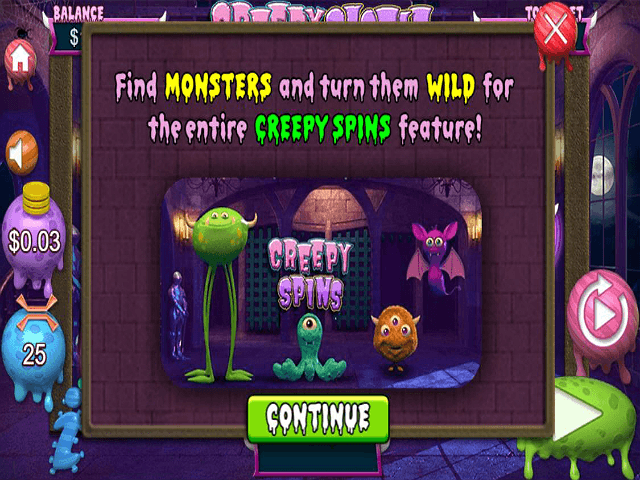 As if that weren't enough wilds for one game, the monsters appear again when you unlock a free spins bonus. After rolling in three or more scatters, you'll receive up to 15 free spins as well as the chance to add some wilds to the mix. Just before your free spins kick into life, you'll have to open mystery doors to reveal certain monsters. Any you find will turn into sticky wilds and hang around for the duration of your free spins. Although some of you may wish for some sort of instant-win bonus, the uncertainty of the wilds can make this game more exciting and something almost all players will get a kick out of. Share this Creepy Castle Review today! If you like Creepy Castle, you'll love these slot titles too!